Finally! Automatic Coupons and Cashback!! Piggy applies coupons automatically and pays you cashback up to 20% with every shopping trip. Use the Piggy apps to save at over 3,000 stores. Shop like you normally do. Piggy will appear in cart to apply coupons and cashback. Once your balance reaches $25+, Piggy will send you a check! 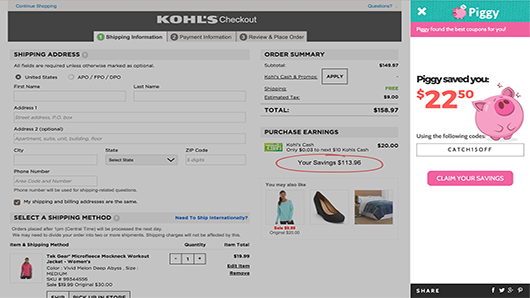 Using the Piggy apps ensure you never miss a coupon or cashback deal again.